What is this trendy thing called Instagram that all the cool kids seem to be into? It's been around for a few years, quietly picking up traction mostly thanks to everybody's new obsession with mobile photography. Instagram is a social networking app made for sharing photos and videos from a smartphone. Similar to Facebook or Twitter, everyone who creates an Instagram account has a profile and a news feed. Pretty straight forward, right? It's like a simplified version of Facebook, with an emphasis on mobile use and visual sharing. Just like other social networks, you can interact with other users on Instagram by following them, being followed by them, commenting, liking, tagging and private messaging. You can even save the photos you see on Instagram. Instagram is available for free on iOS devices, like the iPhone and iPad, as well as Android devices, like phones and tablets from Google, Samsung, etc. It can also be accessed on the web from a computer, but users can only upload and share photos or videos from their devices. Before you can start using the app, Instagram will ask you to create a free account. You can sign up via your existing Facebook account or by email. All you need is a username and a password. You may be asked if you want to follow some friends who are on Instagram in your Facebook network. You can do this right away or skip through the process and come back to it later. It's always a good idea to customize your profile by adding your name, a photo, a short bio and a website link if you have one when you first get on Instagram. When you start following people and looking for people to follow you back, they'll want to know who you are and what you're all about. 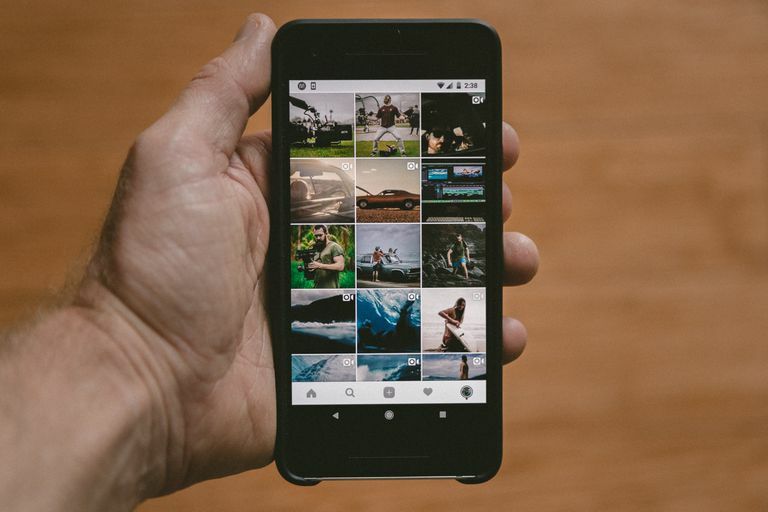 As previously mentioned, Instagram is all about visual sharing, so everybody's main intention is to share and find only the best photos and videos. Every user profile has a “Followers” and “Following” count, which represents how many people they follow and how many other users are follow them. Keep in mind that when your profile is created and set to public, anyone can find and view your profile, along with all your photos and videos. Learn how to set yours to private if you only want the followers you approve to be able to see your posts. Interacting on posts is fun and easy. You can double tap any post to “like” it or add a comment at the bottom. You can even click the arrow button to share it with someone via direct message. If you want to find or add more friends or interesting accounts to follow, use the search tab (marked by the magnifying glass icon) to browse through tailored posts recommended to you. You can also use the search bar at the top to look for specific users or hashtags. Instagram has come a long way since its early days in terms of posting options. When it first launched in 2010, users could only post photos through the app and add filters without any extra editing features. Today, you can post both directly through the app or from existing photos/videos on your device. You can also post both photos and videos up to one full minute in length, and you have a whole bunch of extra filter options plus the ability to tweak and edit. When you tap the middle Instagram posting tab, you can select the camera or video icon to let the app know whether you want to post a photo or a video. Capture it through the app, or tap the photo/video preview box to pull up a previously captured one. Instagram has up to 23 filters you can choose to apply to both photos and videos. By tapping the Edit option at the bottom of the photo editor, you can also apply editing effects that allow you to edit adjustments, brightness, contrast and structure. For videos, you can trim them and select a cover frame. If you want to edit your photo or video within the Instagram app, simply tap the wrench icon and choose a feature from the bottom menu. You can adjust the contrast, warmth, saturation, highlights, shadows, vignette, tilt shift and sharpness. After you’ve applied an optional filter and possibly made some edits, you’ll be taken to a tab where you can fill out a caption, tag other users to it, tag it to a geographical location and simultaneously post it to some of your other social networks. Once it's published, your followers will be able to view it and interact with in their feeds. You can always delete your posts or edit their details after you published them by tapping the three dots at the top. You can configure your Instagram account to have photos posted on Facebook, Twitter, Tumblr or Flickr. If these sharing configurations are all highlighted, as opposed to remaining gray and inactive, then all of your Instagram photos will automatically be posted to your social networks after you press Share. If you don't want your photo shared on any particular social network, simply tap any one of them so that it's gray and set to Off. Instagram recently introduced its new Stories feature, which is a secondary feed that appears at the very top of your main feed. You can see it marked by little photo bubbles of the users you follow. Tap any one of these bubbles to see that user's story or stories that they published over the last 24 hours. If you're familiar with Snapchat, then you'll probably notice how similar Instagram's stories feature is to it. To publish your own story, all you have to do is tap your own photo bubble from the main feed or swipe right on any tab to access the stories camera tab. If you want to find out more about Instagram stories, check out this breakdown of how it differs from Snapchat.